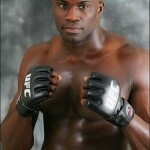 Cheick Kongo Joins Rampage at Team Wolfslair. MMAWeekly.com reports that Cheick Kongo has decided to follow good friend Rampage Jackson’s path and part ways with Juanito Ibarra and join team Wolfslair. UFC’s latest Heavyweight superstar Brock Lesnar, who is coming off an impressive and dominant victory against Heath Herring is rumoured to be ready to fight again in November. His opponent? Cheick Kongo? We don’t know yet.